Every life is a vocation and every vocation is linked to a particular mission to be accomplished. From the beginning of the history of salvation, God has asked men for their collaboration to realize His plan of salvation for the benefit of humanity. In the Old Testament the patriarchs and the prophets were called, in the New Testament Jesus and the apostles. But God still continues today to call men and women so that they may collaborate in building His Kingdom in the world and may spread his message of love and peace throughout the world. From today's readings we understand that the divine call is above all the manifestation of God to man. God reveals Himself in His greatness and goodness before sending someone and entrusting a mission. Man finds himself before the truth of God that enlightens him and makes him understand his reality as a weak, fragile, limited, sinful creature. Yet God uses man to spread his message of salvation. It is interesting to see the experiences, the feelings, the fear for the awareness of one's own unworthiness and finally the generous response of Isaiah, Peter and the apostles. Isaiah, before the manifestation of God, feels his sin and the sin of his people, but opens up to trust. So Peter: in the Gospel Jesus says to Peter: "Put out into deep water and lower your nets for a catch". "Master, we have worked hard all night and have caught nothing, but at your command I will lower the nets." 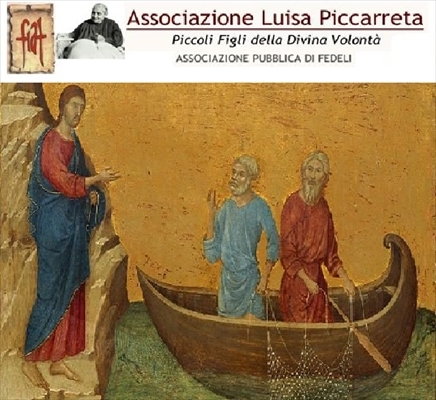 By faith Jesus performs for Peter and his companions the miracle of abundant fishing. Peter, before Jesus, recognizes his weakness and his sins: "Depart from me, Lord, for I am a sinful man." But Jesus calls him through a great vocation: "Do not be afraid; from now on you will be catching men." And the generosity of the answer is still underlined: "They left everything and followed him", because they had found Jesus. Jesus is everything and constitutes them participants and continuators of His mission. We know that Jesus gave a particular mission to Luisa, that is, the knowledge of the Divine Will and of the manifestation of God’s Kingdom. On 25 August 1929, Jesus explained to Luisa how He created the seed of the Divine Fiat in forming the ‘Our Father’. Jesus coming upon earth and everything He did in Redemption, His very Death and Resurrection, was nothing other than preparatory act for the Kingdom of His Divine Will; and when Jesus formed the ‘Our Father’, He formed the seed of the Kingdom of His Divine Fiat in the midst of creatures. And if, when He speaks, He creates and He makes the greatest, most beautiful and marvelous works come out of nothing, much more so when, with the empire of His speaking prayer, He has the virtue of creating what He wants. Therefore, the seed of the Kingdom of God’s Will was created by Him in the act of His praying, as He formed and recited the ‘Our Father’. And if He taught it to the Apostles, it was so that the Church, by reciting it, might water and fecundate this seed, and they might dispose themselves to model their lives according to the dispositions of His Divine Fiat. His knowledges about It, His many manifestations, have developed this seed; and since they have been accompanied by the acts done by us in the Divine Will, so many little grains have formed as to form a great mass, from which each one can take his part - always if they want to - in order to live of the Life of the Divine Will. Therefore, everything is there, the most necessary acts. There is the seed created by Me, because if there is no seed, it is useless to hope for the plant; but if the seed is there, it takes work, the will of wanting the fruit of that seed; and one is sure of having the plant, because, by possessing the seed, one has in his power the life of the plant of that seed. There are those who water this seed in order to make it grow - each ‘Our Father’ that is recited serves to water it; there are His manifestations in order to make it known. All that is needed are those who would offer themselves to be the criers - and with courage, without fearing anything, facing sacrifices in order to make it known. So, the substantial part is there – the greatest is there; the minor is needed – that is, the superficial part, and Jesus will know how to make His way in order to find the one who will accomplish the mission of making known His Divine Will in the midst of the peoples. Therefore, on our part, we should not place any obstacle – let us do what we can, and Jesus will do the rest. One who places himself in the unity of the Divine Will, places himself in the light; and just as the light has the virtue of descending down below and of laying itself like a mantle of light over each thing it invests, so it has the virtue of rising up high and of investing with its light that which is up high. In the same way, one who places himself in the Light of the Fiat, in Its unity of Light, with his acts descends down below to all generations, and with his acts of light he invests everyone in order to do good to all; and he rises up high and invests the whole of Heaven to glorify all. Therefore, in the Divine Will the soul acquires the right to be able to offer the Light of the Eternal Fiat to all, through the gift of her acts multiplied into as many as are those who want to receive It. We can live our life as a vocation; a vocation to continue the work and mission of Jesus, with the generosity of the heart: "Behold, I am here, send me.!"